The article deals with the problem of possible structure and properties control of low chromium white cast-iron by means of its modification and electro-pulse treatment with subsequent modification. Kinetics and mechanism of the modification effect are described on the basis of the results of elements microanalysis in different cast-iron structural components. Electro-pulse treatment of melt being done before modification, the hardness and micro-hardness of structural components of cast-iron increases significantly due to the intensification of phase separation processes of cast-iron components. Wear and heat resistance of the modified chromium cast- iron also increases. Keywords: Modification, electro-pulse treatment, crystallization, structure formation, hardness, micro hardness, wear resistance, oxidation resistance. 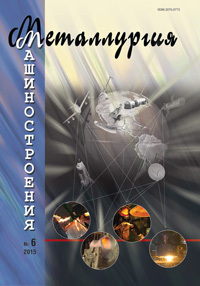 This article describes and analyzes the types of phosphorus-containing raw materials, such as red phosphorus, phosphorus oxide and production methods ligatures aluminum-boron, such as: red phosphorus, phosphorus oxide, phosphorus chloride, ligature Fe–P, ligature Cu–P and methods introduction to aluminum alloys. And also lists the main producers of phosphorus-containing products. Keywords: Ligature, aluminum, phosphorus, alloy, modification, structure, silumins. In this study the quantity of modification ligatures to be introduced into A356.0 alloy was optimized based on gained results of research of correlation between mechanical properties and structural composition of alloy. Keywords: Silumins, modification, silicium, eutectic phase, primary crystals, strontium, titanium, boron. Key words: single crystal, nickel base superalloy, vacuum induction melt, impurities, sulfur, phosphorus, active metals, lanthanum, yield. Presented are the results of experiments on producing heat-resistant Ni alloy powder by gas-dynamic spraying using high-pressure argon. Grain size distribution of the produced powder, its crystalline structure, and presence of defect signs of the powder particles are investigated..
Key words: Spraying by high-pressure gas, metallic powders, heat-resistant nickel-based alloy, crystalline structure. In the first part of the work shows that during solidification of Al alloys – 15...30%Si it is possible to form patterns with small allocations of the Si-phase (eutectic) and large (primary and secondary crystals). The methods of heat treatment, which allows to obtain the structure that meets the required mechanical properties. The correlation between structure and thermal expansion of the studied alloys. Responsible for the formation of structure and properties of alloys proposed as hydrogen. On the example of the alloys Al–30...50%Si shows the possibility of creating a new strain of materials with low values of the coefficient of linear expansion, low specific weight and excellent mechanical properties. Key words: Hydrogen, alyumin-silicic alloys, mechanical properties, microstructure, thermal expansion, deformation. The hereditary influence of the strain of waste on the density and electrical conductivity of the alloy 1420 (Al–Mg–Li) was studied. It is established that the alloying of aluminium elements with large values of the solubility criterion (Mg, Li) causes increased tendency of the alloy to the inheritance patterns of the initial charge. Samples obtained from the deformed plates of 2 mm thickness, had higher values of density in liquid and solid States. The electrical conductivity was changed by a reverse law: with a decrease in the degree of deformation of the initial charge was increased the electrical conductivity before and after single remelting. Key words: Alloy 1420, the system Al–Mg–Li, the solubility criterion, structural heredity, strain the mixture, density, electrical conductivity. Compositions of aluminum-zinc alloys are offered for soldering of assemblies of radio engineering appointment. It is shown that increase of the zinc content in an aluminum alloy, in proportion reduces temperature of its melting and increases its mechanical properties, while maintaining high plastic properties that allow processing these alloys with high extent of deformation. The structure of the received alloys has the eutectic type that gives to alloys high castability which provides high solder properties. Key words: Aluminum-zinc alloy, solder, structure, mechanical properties, assemblies of radio engineering appointment. Shown are the possibilities of the 3D X-ray computer-aided tomography (CT) method at nondestructive quality check of metals, including cast ones, and products made thereof. Given are examples of using CT to examine the structure of heterophase materials and morphological aspects of alloys’ crystallization. Key words: Computer-aided tomography, nondestructive check, structure of cast materials. On the background of the extraordinarily low volume of using new technologies in domestic machine-building industry, especially noticeable is the lack of information on the principles of modern special casting methods, their implementation variants and development trends. The work proposes a uniform view on the thixo- and PIM-technologies – casting methods using an unconventional paradigm of crystalline structure formation in precision-cast pieces, examples of their implementation are given. Key words: Thixo-technologies, PIM-technologies, rheology, highly filled suspensions, fluidic behavior, viscosity, simulation methods, casting peculiarities.